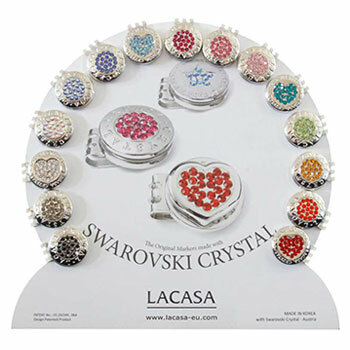 La Casa magnetic markers decorated with Swarovski® Crystals are a fashionable, very functional, sparkling and eye-catching accessory for hats, caps, visors and shoes on and off the golf course. 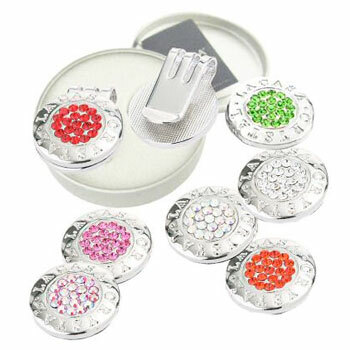 La Casa Crystal Markers make a glamorous and elegant accessory embellished with colorful Swarovski® crystals for all those who like a trendy and functional golfball marker. Personalize your head-dress or golf-shoe with a touch of glamour with this fashionable sparkling and eye-catching golf accessory. The trendy La Casa marker clip is made from durable steel materials, feature a silver tone trim finish and has an extremely powerful magnet to hold your ball marker fast. They easily attach to your cap, visor, shoe, belt or golf bag for easy access or make a perfect idea for golf events and also fantastic tournament prizes.